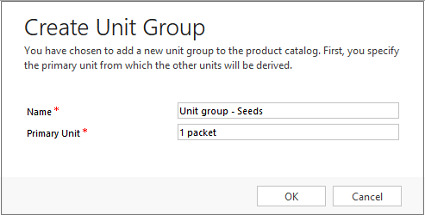 In Dynamics 365, you first create a unit group and then create units within that group. Let’s look at both of these tasks, using seeds as our example. To create a new unit group, choose New. To edit a unit group, open a unit group from the list. Primary Unit. Type the lowest common unit of measure that the product will be sold in. In our example, you would type “packet.” Other examples could include ounces, hours, or tons, depending on your product or service. You cannot delete the primary unit in a unit group. In the unit group you want to add the units to, in the left pane, under Common, choose Units, and then on the Units tab, in the Records group, choose Add New Unit. The unit that you specified as the primary unit earlier is already in the list of units. If you then create a unit called “pallet,” and one pallet contains 48 boxes, you would type “48” in Quantity and select “box” in Base Unit.